The Rose Electronics RP2-2R2X8U/2 is a 8-port, multi-user KVM Switch for use by 2 remote and 2 local users. UltraMatrix Remote 2 represents the next generation in KVM switches. It not only provides a comprehensive solution for remote server console access, this access can be local or from any workstation on your network over IP. The UltraMatrix Remote switch can easily be expanded to other KVM switches to make a seamless and truly scalable KVM matrix switch. Question: Are the cables included with this product? Answer: Thank you for your inquiry. For the greatest flexibility, this KVM does not come with KVM cables. We have added a table of compatible KVM cables to the bottom of the page and a link to the Rose KVM Cable page on the right side. 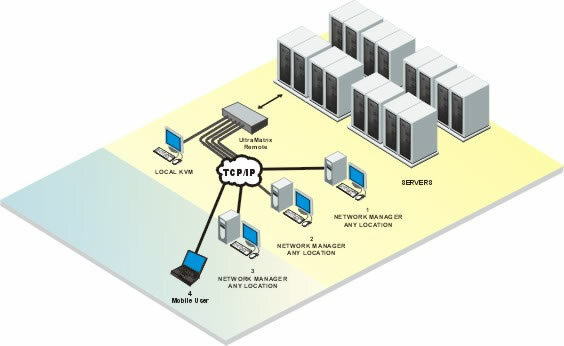 Question: Is it possible to work with multiple IP connections at the same time (on different servers)? And is it possible to open two browser windows and work on two servers? It is possible to have multiple concurrent users / multiple browser windows open with different devices, using a multi user KVM Over IP switch. For connecting to multiple devices concurrently, please see the KVM Over IP page and choose the category based on the amount of concurrent users you would need. Alternatively you can also have concurrent access to a single computer using a KVM over IP Gateway.